Down boss Eamonn Burns believes the arrival of former Antrim joint manager Gearoid Adams onto his backroom team is the perfect boost. Burns, who is about to step up his preparations for the 2018 season, believes that Adams, who was in charge of the Saffrons for the past two years in tandem with Frank Fitzsimons, will bring "plenty to the table" as the Mournemen focus on building upon the progress they made this year. It had been initially thought that Fitzsimons and Adams would have their wish to remain at the Antrim helm for another term granted but, when the county board sought nominations for the post and decided interviews would be held, Adams walked away and was eventually followed by Fitzsimons. Adams subsequently criticised how the nominations process was conducted in the county and questioned the value of the football review committee, which conducted the end-of-year interviews. Under the baton of Fitzsimons and Adams, Antrim achieved promotion to Division Three of the league but were unable to retain their slot and slipped back into Division Four this year. While in charge, the duo introduced a raft of new talent to the side, and several of those players, including Patrick McBride, Peter Healy and Matthew Fitzpatrick, have come through strongly. For now, though, Adams is certain to bring an added dimension to Down's preparations for the 2018 campaign given his experience and ability to establish a strong rapport with players. Manager Burns certainly does not harbour any doubts that Adams will bring his own qualities into play with the Mournemen, who enjoyed a renaissance this year having commenced their campaign from a low ebb. "I decided to re-define a few roles within my backroom team, and the acquisition of Gearoid Adams certainly helps to facilitate this," explained Burns. 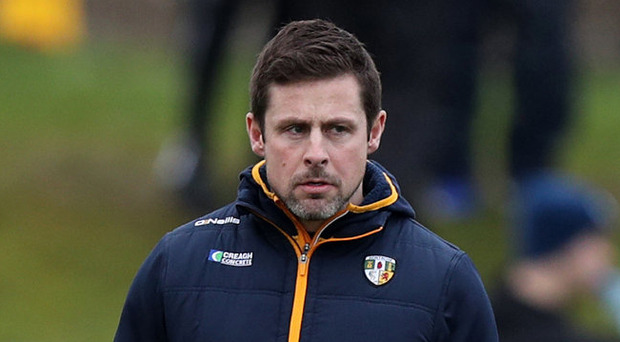 "He will bring considerable expertise into play from a coaching perspective and he also accumulated vast experience during his lengthy spell with Antrim. "I always noted when we played the Saffrons while he and Frank were in charge that their teams were invariably well set up and both men were very cordial." Burns is anxious to see Adams slip comfortably into his new environment and if possible make an impact from the outset. "This will be a new challenge for Gearoid but one for which I feel he is well able," stated Burns. "He is obviously very familiar with Ulster football, and indeed football throughout the island, so he won't be fazed by any aspect of his role. "I think both he and Frank did a good job at Antrim even if, just like ourselves, all their results did not go the way they would have wanted. "Our aim now is to build on the little bit of progress we made this year and hopefully we will be able to achieve this."